And because I’m running a marathon on Sunday, July 11, 2010, at 6 a.m., it means that on Thursday, July 8, 2010, at approximately 9:15 a.m., I transitioned into Marathon Mode. In this state, all thoughts and actions revolve around the impending footrace, and normal behavior ceases to exist. 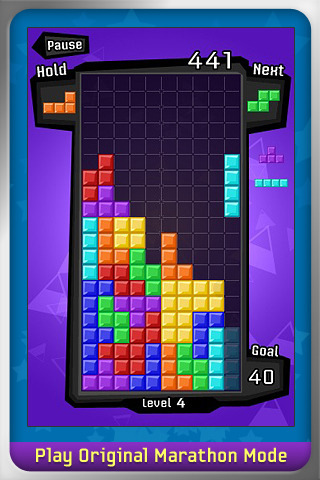 Marathon Mode: Also an option in Tetris. It only takes a few seconds for Marathon Mode to “click,” and when it does, nothing else matters but the race. All thoughts revolve around the marathon, and anything anyone says to you pertains to the marathon, because why in the world would they talk to you about anything but the marathon when it’s less than TWO DAYS away?!? Yesterday, for example, when my boss asked me “so, are you registered?” I immediately replied “For the marathon??? Yes, of course!! !” He was supposedly referring to a training course at work, which we had discussed a mere five minutes prior. But why would he be asking me about something like that because doesn’t he know I’m about to RUN A MARATHON?!?! However, this logic does not occur to a person in Marathon Mode, and she takes the elevator instead of climbing one flight of stairs, lest she risk a career-ending injury. Since you basically have to be crazy to run a marathon in the first place, I figure Marathon Mode is just nature’s way of preventing total delirium overload on the big day. Let’s just hope my bout with insanity — and my race — are swift and (relatively) painless. You’ve definitely got the crazy part down. Congrats, lady!! You did great! It was good to see ya!